Distinguished theatre and film actor and director. Distinguished theatre and film actor and director. Born December 24, 1883 in Żukowice Stare near Tarnów, died August 11, 1945 in Otwock. Jaracz attended lower secondary school in Tarnów, but was expelled, most likely for membership in an illegal youth organization. He continued his secondary school education in Jasło, completing it as an external student in Bochnia in 1903 with one resit which he passed in Krakow's Saint Jacek's secondary school. He continued his education studying law, history of art, Polish literature and nature at Jagiellonian University. He lived very modestly, earning his living by proofreading for the socialist daily "Naprzód", he had become a socialist sympathizer while in secondary school. After two semesters, he gave up his studies and joined a theatre company, theatre having been his interest since his school days in Tarnów where he had acted in amateur school performances, playing the part of the Journalist and Nose in Stanisław Wyspiański's Wesele / The Wedding in 1902. In 1904 Jaracz found employment at Krakow's Teatr Ludowy and debuted anonymously as Opryszek / Thug in Józef Korzeniowski's Karpaccy Górale / The Carpathian Mountaineers. Shortly afterwards he moved to the Poznań theatre where he worked until 1907. He was drafted to the Austrian army for a year. Then worked at the theatre in Łódź from 1908 to 1911. In 1911 Jaracz settled in Warsaw, working first at the Maly Theatre and in 1913 joining the Polski Theatre which was founded and managed by Arnold Szyfman. In 1915 he was deported, by force, to Russia where he acted in Polish theatre companies in Moscow and Kiev. Upon his return to Poland in 1918, he became one of the founders of the Polish Actors Association (ZASP) and played at Warsaw's Polski Theatre (1918-21), Juliusz Osterwa's Reduta Theatre (1921), Rozmaitości Theatre (1923-4) and National Theatre (1924-7), meanwhile giving guest performances in Łódź and Poznań. In the late 1920s Jaracz's addiction to alcohol deepened, leading to depression and a suicide attempt. He found it increasingly difficult to gain employment at any theatre. He cancelled performances, caused scandals, started conflicts with theatre directors and the actors association. Yet he overcame his predicament and began to work very intensively, playing with an itinerant company in over ninety Polish towns between 1927 to 1928. Then he sought individual contracts and was an actor of the Warsaw National and Polski Theatres, the Vilno Reduta, and the Krakow Słowacki Theatre. By the end of the 1920s he was an established actor, with parts in both major and minor theatres. He had been an excellent Caliban in Józef Sosnowski's staging of Shakespeare's The Tempest in Warsaw's Polski Theatre in 1913, Judas in a play by the same name by Kazimierz Przerwa-Tetmajer in Warsaw's Reduta in 1922, and Szela in Stefan Żeromski's Turoń in the same theatre the following year. From the beginning of his acting career Jaracz was a keen and increasingly accomplished actor of modern characters, playing people who were poor, naïve and on the margins of history. And so Jaracz was Franio in Włodzimierz Perzyński's Szczęście Frania / Franio's Happiness (The Teatr Miejski in Łódź, 1910), Jakub in Tadeusz Rittner's Głupi Jakub / Stupid Jakub (The Teatr Miejski in Łódź, 1911) and Smugon in Stefan Żeromski's Uciekła mi przepióreczka / The Little Quail (The Reduta, 1925). His acting understated and free from affectation, Jaracz was able to create characters who were profoundly human, moving and simple. He was considered to bring to the theatre a somewhat plebeian flavour that added verity to his roles. Sometimes he played bluntly, although over time his acting became more detached and would at times reveal a hint of mockery. Nevertheless he was regarded as an actor who empathized with, respected and defended his protagonists, and who conveyed their suffering. He worked hard on his roles, polishing them and sometimes introducing major changes to stagings in other theatres. In 1930 he opened his own theatre, The Ateneum, in Warsaw. He managed it until the start of the war within the years 1933-5, in the season of 1932-3 he shared his management with Leon Schiller. The Ateneum was intended as a theatre for the masses, popular yet maintaining a high artistic standard, one that would disseminate culture in the working-class Powiśle district of Warsaw. It soon evolved into one of Warsaw's most fashionable theatres, arousing considerable interest of the intelligentsia. Jaracz took his theatre company on a number of tours, playing all over Poland, including Krakow and Łódź. His close collaborator was Stanisława Perzanowska, The Ateneum's main director, noted for her stagings of plays dealing with contemporary issues, notably Elmer Rice's Street Scene (1930) and Georg Buchner's Danton's Death (1931), as well as for her modern interpretations of classical Polish comedies, including Michał Bałucki's Dom otwarty / Open House (1931), Aleksander Fredro's Damy i huzary / Dames and Hussars (1932), and Gabriela Zapolska's Panna Maliczewska / Miss Maliczewska (1932). Perzanowska was an original interpretator of comedies by Pierre Beaumarchais and Nicolai Gogol, and her innovative approach to Moliere, applied to The Hypochondriac (1935), The School for Wives (1936) and The Imposter (1938), soon earned The Ateneum the name of "Moliere's house". "Jaracz and Perzanowska found a common ground for drama and farce", Edward Krasiński commented on the staging of The School for Wives with Jaracz as Arnolphe. At the time the left-oriented Ateneum specialized in topical repertoire dealing with social and political issues. It was here that Leon Schiller staged his socially-involved. "Zeittheater" performances - Sergey Tretyakov's Speak Out, China (1933) and Carl Zuckmayer's The Captain of Koepenick (1932). The latter starred Jaracz as Voigt the Berlin cobbler, a dashing role which was to become his hallmark as a performer of compelling portraits of the disadvantaged. "He is so miserable and goes astray in a world so real that despite being German he remains arch-human", noted down Kazimierz Wierzyński. "He is poor, ridiculous, sad and terrifying ... In an unparalleled tour-de-force, Jaracz embodied the merciful misfortune, the bleakness of a poor man's oppression, the humble wretchedness and Chaplin-like, funny and sad, philosophy" (after H.I. Rogacki, "Leon Schiller. Człowiek i teatr" / "Leon Schiller. The Man and the Theatre", Łódź 1995). Jaracz was also famous for his role of Schweik in Jaroslav Hasek's The Good Soldier Svejk (The Teatr Polski in Warsaw, 1930) and for his appearances in modern dramas: as Skid Johnson in The Artists by Watters and Hopkins (The Slowacki Theatre in Cracow, 1929) and as Christopher Wellwyn in The Pigeon by John Galsworthy (The Ateneum Theatre in Warsaw, 1931). In 1912-1936 Jaracz appeared in films. He was cast in ambitious as well as trashy roles, yet none did justice to his extraordinary acting skills, he was evidently at his best in the theatre. His major film parts included Napoleon Bonaparte in Bóg Wojny / The God of War (1914), Grand Duke Constantine in the historical epic Księżna Łowicka / The Duchess of Łowicz (dir. Janusz Warnecki and Mieczysław Krawicz, 1932) and Konstanty Kurczek in Jego wielka miłość / His Great Love (dir. Stanisława Perzanowska and Mieczysław Krawicz, 1936), a psychological study of an embittered, declassed stage actor turned prompter. Jaracz also played Master Maciej in Pan Twardowski / Mr Twardowski (dir. 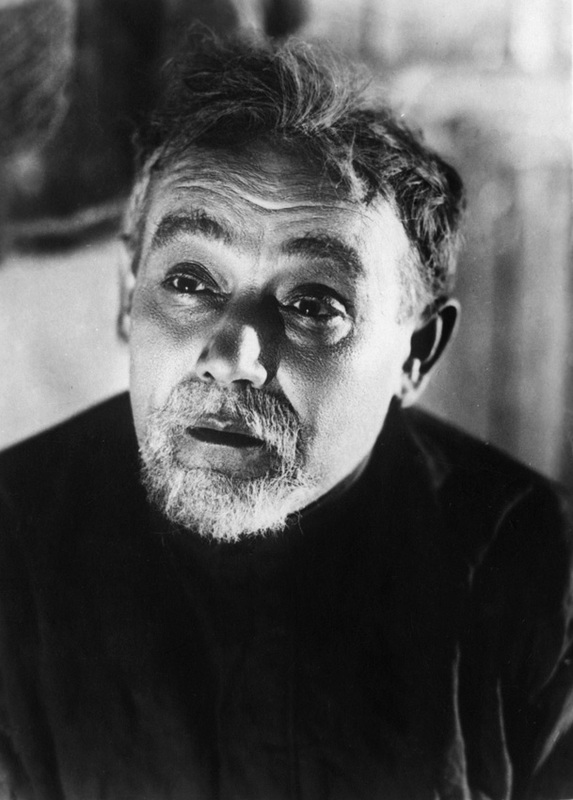 Henryk Szaro,1936), and his last film appearance was as a young revolutionary in a screen adaptation of Stefan Żeromski's Róża / The Rose (dir. Józef Lejtes, 1936). From 1929 till the outbreak of World War II Jaracz regularly contributed to the Polish Radio Theatre, appearing in over sixty plays. His biggest acting success was the three-part philosophical series Trylogia o Sokratesie / Trilogy on Socrates after Plato (1933). "In a regular theatre you cannot really do without a costume and a makeup. Jaracz made do without them when playing in the radio theatre", wrote Jerzy Szaniawski. "Unseen, only heard, he came across in one's mind as a complete man, for it was in his unparalleled speech that his greatness lay" (after E. Krasiński, "Stefan Jaracz", Warsaw 1983). After the war broke out Jaracz moved to Lublin to perform in the Town Theatre. However, the Germans closed down the theatre therefore in late 1939 Jaracz returned to Warsaw. There he recited poems at poetry evenings in cafes and homes as well as occasionally teaching acting lessons at the National Institute of Theatre Arts. In 1941 he was arrested and taken to Oswiecim in a wave of Gestapo repressions after the assassination of Igo Sym. Becoming seriously ill, he was released in less than two months due to poor health. He returned to the suburbs of Warsaw, living in Wawer, Świder and Otwock till the end of the Nazi occupation. He sat on the underground Theatre Council. In 1944 he arrived in Lublin to contribute to the organization of post-war theatrical life, but soon returned to Otwock and wrote his famous letter, later called "Jaracz's Testament". The letter was shared at the first post-war assembly of the Association of Polish Actors (ZASP). Jaracz wrote in it about the vocation of the theatre and the calling of art, and about ethics and public mission of actors. Shortly afterwards, on August 11, 1945, he died in Otwock of tuberculosis. He was buried in the Avenue of Merit at the Warsaw Powązki Cemetery. A collection of his articles was published posthumously in a volume O teatrze i aktorze / On the Theatre and the Actor (Warsaw, 1962). Author: Monika Mokrzycka-Pokora, September 2006.